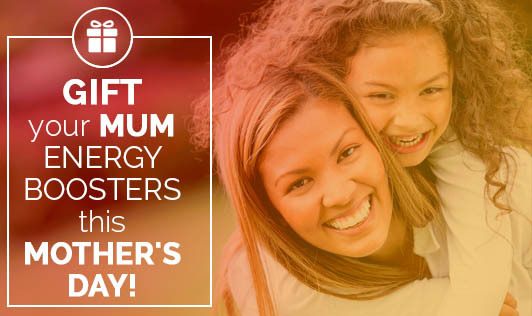 Gift Your Mum Energy Boosters This Mother's Day! • Gobble a bottle of water- drink down a bottle of water in between your work. Mild dehydration can cause headache, fatigue and lack of energy even before you realize that you are thirsty! • Bathing works- a cold shower in the middle of the day is very refreshing! • "Bad mum"- it is okay to take a break from babysitting for a couple of minutes. Let the kids watch TV or play indoor games or go to sleep so that you can relax. By doing this, you and your kid will get personal time and space. • Move your body- it is proven that regular exercise is more beneficial than a nap to boost the energy levels. Take a quick walk with your child or how about a race with your little one in the park? Or just stand up from your desk and stretch yourself or why not try dancing with your kid for a peppy number at home? • Main meal for the day- breakfast is the main meal for the day. A cup of coffee or two is not enough to manage your notorious kids at home! Never skip breakfast as it is the main meal for the day and also an energy translator! • Freshen up- change your clothes, freshen up and keep your hair kempt. You need not have to wear a suit or a new dress but getting out of your baggy sweats will restore your energy levels. • Sleep tight- may be eight hours' sleep isn't practical for a mother of young children, but five hours isn't sufficient. There is no quick cure for lack of sleep. So try sleeping an hour before your usual schedule to wake up with high energy levels. • Quality time- it is very important to spend quality time with your kids. Play with them without a deadline or goal as this is the best energy booster for every mum.